Thank you for choosing DeCarley Trading! The DeCarley Perspective is intended to give you a broad based view of the financial and commodity markets and provoke you to explore various market approaches. If you are receiving this, you will also be receiving trade recommendations distributed by email as we identify opportunities. We appreciated any feedback that you can offer us in how to make this newsletter better. Please feel free to communicate your needs and wants to us. ** In regards to seasonality references and/or speculations made in this newsletter, past results are not indicative of future results. Seasonality and supply/demand factors are currently priced into the market and may not influence future price moves. ** All included charts are courtesy of Gecko Software, Track n' Trade. The U.S. stock indices are facing what some are referring to as unprecedented amounts of uncertainty; Inflation and economic concerns are only the beginning. Geopolitical tension, the credit crisis, the possibility of domestic terrorism and the upcoming Presidential election have all worked against investor confidence and has prevented hoards of sidelined cash from making its way into the market. From a rational perspective, earnings multiples have dropped to attractive levels and it is conceivable that mutual funds and individual investors will eventually look to put their money to work in riskier assets such as equities. The broad market hasn't progressed in nearly a decade but safe haven money won't want to miss the boat when the stock market finally comes back to life. Just as investors clamored to commodities in 2007 and 2008, once the train begins to leave the station idle cash may be thrown at Wall Street. Take it from me, picking a market bottom is next to impossible. However, understanding that while things are looking gloomy now, they can, and in my opinion likely will, turn around sharply and without warning. Whether you are bullish or bearish in the near term, the potential of the aforementioned should be in the back of your mind as you determine a trading strategy. If you follow my daily newsletters, you are aware of the market approach that I have recommended in this scenario. I like the idea of selling puts in the S&P and Dow during times of heightened volatility. Put selling involves limited profit potential and unlimited risk, but I believe that the odds of success are attractive. You will find more about this strategy in the Option e-Book located in the premium content section of our website. The most recent recommendation in the S&P involved the sale of an 1160 put in which we are now advising those that entered the trade to take profits. Next, we have our eye on the possibility of another spike low. With option expiration looming next week, this vision may become a reality soon. Such a move may create attractive option premium for put sellers. Keep an eye on The Stock Index Report for details. As you read through this report, you will find that we are predicting a relatively significant price reversal in many of the markets; Treasuries are no exception. Interest rate trade has undergone several large changes in sentiment regarding inflation and growth prospects in 2008. In other words, the market has been fighting between inflation and deflation, or slower economic growth. 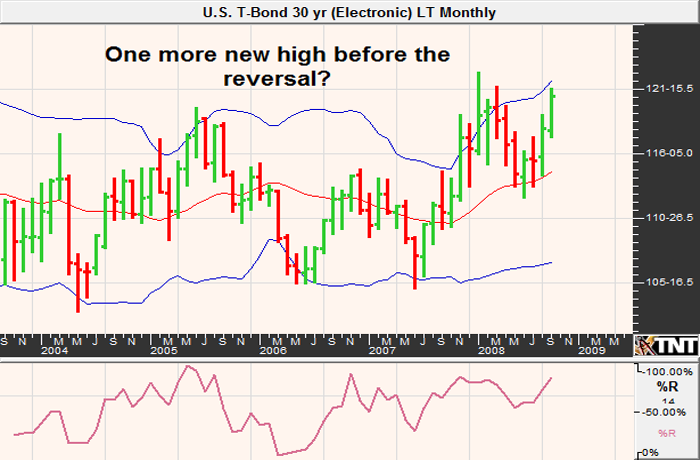 As a result, Treasuries across the curve have experienced dramatic price reversals and trends. In recent months, trade has been fixated on the slowing economy while signs of inflation pressures have been shrugged off. However, I don't believe that this can last. From a fundamental standpoint it seems as though Treasuries are nearing the end of their current cycle and could be in store for a dramatic price reversal. 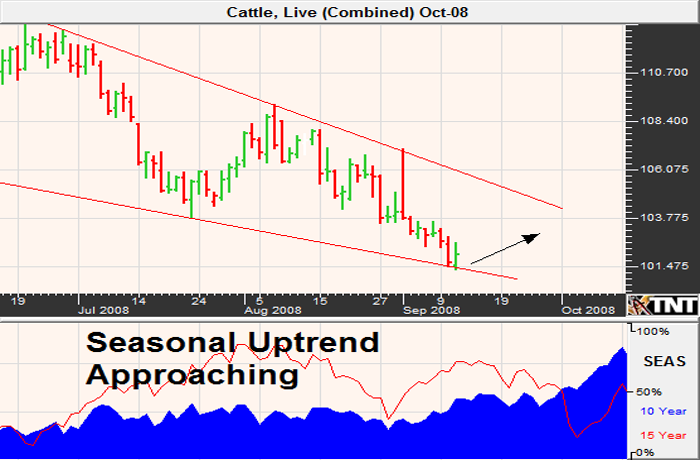 Seasonal tendencies, as well as the technical picture of the marekt, are supportive to the premise of a trend change in the coming weeks. Accordingly, selling calls against swift ralliles seems to be a viable strategy. Once again, if you are unfamiliar with option selling we reccomend readign the Option e-Book found in the premium content section of www.DeCarleyTrading.com. We also like the idea of selling futures in the 10 year note and 5 year note at slightly higher levels; depending on the circumstances it may be apropriate to purchase call otpiosn as a form of insurance to hedge against the unlimited risk of a futures trade. Please stay tuned to the Bond Bulletin for details. It was nothing less than breathtaking to witness the grain complex shatter all time high price records and continue to climb during the 2007/2008 rally. Later in 2008, many retail traders and likely even fund managers watched in horror as the grains made their way relentlessly lower. There are several theories attempting to explain the move including ethanol demand, long only hedge funds and ETF's, shear market exuberance in the absence of an attractive equity market and sidelined cash looking for a home. One thing is certain...the agricultural markets overshot their equilibrium prices and expecting market fundamentals to maintain $7 corn, $13 wheat and $17 soybeans was simply unrealistic. However, nobody knew just how high prices might go before coming to a more rational level and those that entered the market "early" with bearish strategies likely paid a high price. With prices now at debatably more rational levels, yet still well beyond historical standards, grain traders are faced with much more difficult decisions in terms of price speculation. Speculation in the grain markets has potentially become more lucrative, but the risks have been magnified. We have witnessed unfathomable levels in corn along with an unprecedented correction in price. 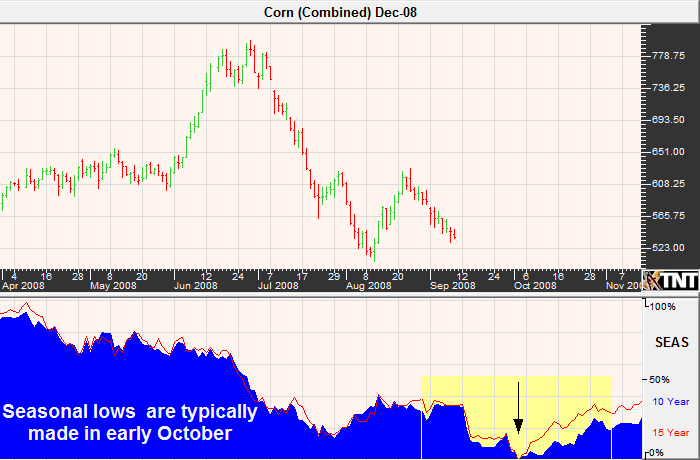 The new trading environment in grains has posed several challenges to both technical and fundamental traders. After all, a commodity that has spent most of its time trading between $1.90 and $4.00 in previous decades, has recently experienced a drawdown in price per bushel by nearly $2.00 from prices in excess of $7.00 in a matter of a few short weeks. In 2006, corn prices established a new "norm" as the market soared above the $4.00 mark and seemed to be somewhat comfortable trading in the $4.80 to $5.50 range. This isn't the first time that corn has redefined its equilibrium level; in the late 1960's to early 1970's corn prices jumped from a range of $1.00 per bushel to $1.60 to create a new price floor of $1.90. What we have just witnessed in recent years may have been the market simply re-pricing itself to the new world of supply and demand as well as attempt to keep up with inflation. In past instances of such a market restructuring, previous resistance has become the "new" support. If this theory holds, corn prices should trade consistently above $4.00 per bushel in the long run. Assuming this is an accurate analysis; I wouldn't feel comfortable recommending that anybody buy corn at current levels as a long-standing position trade. At the time I was writing this, the December corn contract was trading near $5.60, approximately $2.00 off of the recent high but not necessarily a bargain in my eyes. With that said, that doesn't mean that there won't be buying opportunities in the short term (weekly to monthly time frames). Markets almost never go straight up or straight down, and $5.30 per bushel looks to offer significant technical support while $5.00 should introduce psychological support. If the technical and seasonal circumstances are right, attempting to buy the" harvest lows" near the end of September may be a good play but overstaying your welcome could prove to be treacherous. The November soybean futures also have a tendency to forge harvest lows in early October. In fact, based on seasonal data compiled by Gecko Software, the seasonal strength seems to be much more evident than it is in corn. Once again, despite an approximate $4 plunge from its highs in late June, soybean prices are at levels that were once considered to be an anomaly. Before the 2007/2008 rally soybean futures had only traded above $10 per bushel a handful of times, and chants of "beans in the teens" seemed to be more propaganda than reality. We now know that combined with strong fundamentals and perhaps a touch of self-fulfilling prophecy, soybeans have carved out a new trading range. The old "ceiling" of $10, may now be the new market floor for the time being. 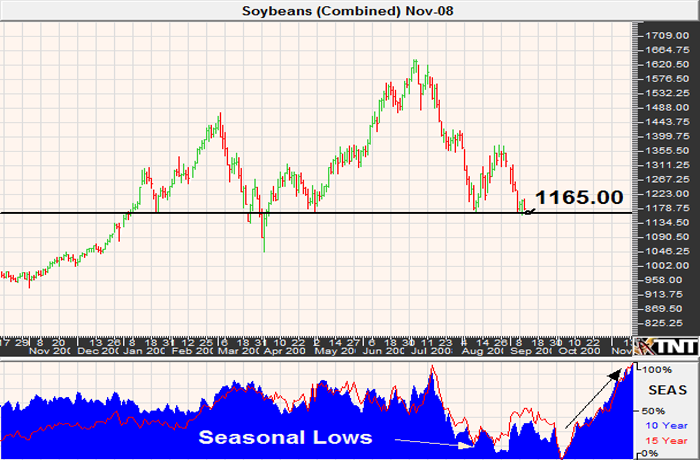 More specifically, with the seasonal lows due shortly the November bean futures may find support at $11.78 per bushel. This was evidenced by a recent overnight rally from similar levels. Possibly the most magnificent of the grain movers has been wheat. After finding a low near $2.00 per bushel in 2004, the front month contracts peaked in 2008 at an astronomical price of in the vicinity of $13. The move was glorious for those on the right side, and pure torture for those caught on the wrong side of the historical move. There were several very experienced grain traders that underestimated the hysteria and conceivably the move may have put many out of the business forever. The subsequent correction, was just as breathtaking and likely had a hand in making or breaking the careers of many beginning and veteran traders. What to do from here? From a strictly technical standpoint, the market has been trading in a descending triangle since the beginning of the second quarter of 2008. Current pricing looks to be at or near support and is in agreement with the seasonal low as noted to be in mid-September by the figure below. 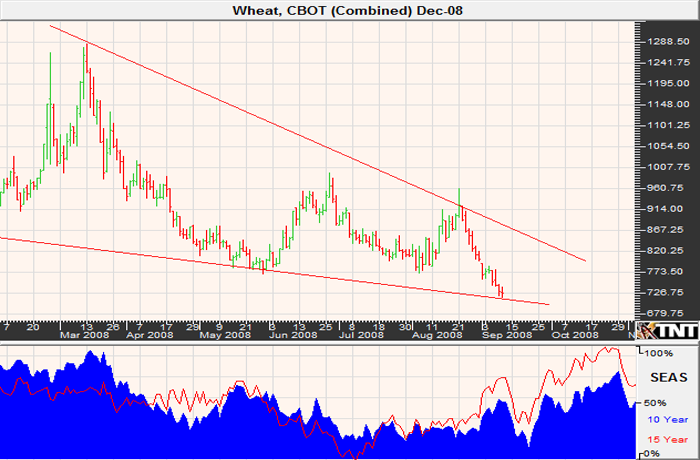 Wheat is still at historically high prices, but the market seems primed for a corrective move higher. I see the potential for $8.28 on the upside should the bulls get momentum from covering shorts. The energy complex and precious metals are often looked at together due to their high correlation with one another as well as the fact that they are both traded on New York Futures exchanges. In my opinion, they are also equally as erratic. Each of these markets offer traders with an abundance of opportunity but carry with it an abundance of risk. However, there are ways in which option spreads or combinations of options and futures can work to reduce the volatility in what are often referred to as the world's most treacherous markets. 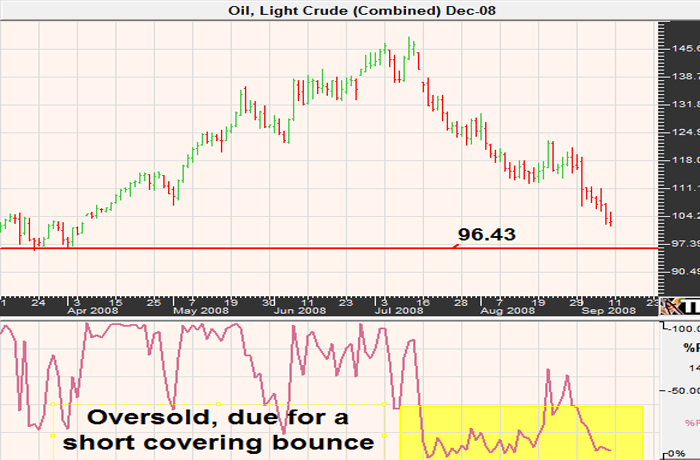 Beginning traders tend to be attracted to crude oil futures. I can see why; you can't turn on the TV without hearing about it and you can't fill up your gas tank without thinking about it. However, trading crude oil can be a unique challenge. The margins are high, the options are expensive and the environment is unfriendly. With that said, there are ways to trade this market with limited risk and rather attractive profit potential and what we believe favorable odds of success. This can be done through the use of an Iron Butterfly spread (if you are unfamiliar with this strategy, be sure to read about it in the Option Trading e-Book located in the premium content section of DeCarleyTrading.com). Demand for crude has fallen, and so has the hype. However, being the contrarian that I am, I can't help but feel that this market is due for a move higher. Markets often make their move once everyone has given up, and we may be at that point in the near-term. It is possible that a short covering rally could ensue in the coming weeks to bring the October crude to test resistance levels near $113 and $121. Critical support lies at the $100 mark and again at about $96.40. Failures at these levels could prove me wrong and send crude oil prices into the $80 range. The precious metals have fallen out of favor due to the new found strength in the U.S. dollar along with weakness in the energy complex. As mentioned previously, the metals and energies can be highly correlated at times. If our predictions regarding a temporary rally in crude oil turn out to be accurate, both gold and silver should follow. As gold buying is becoming unfashionable again, the sellers may have all entered the market. If so, selling should begin to dry up and short covering buying will come into play pushing gold prices higher in the coming weeks or months. 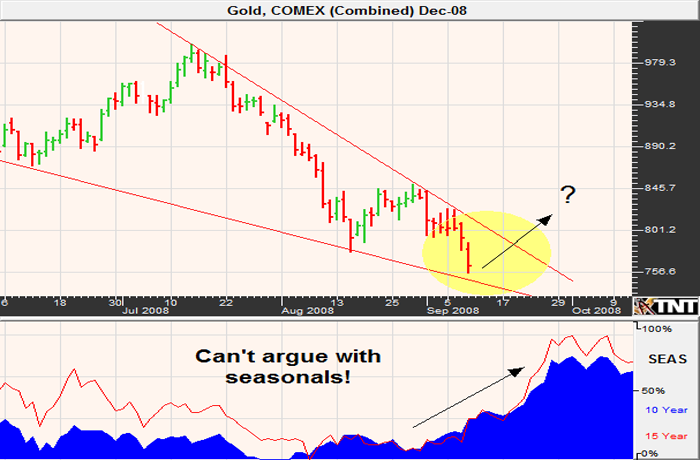 Additionally, we are entering a bullish time of year for gold. Historically, the seasonal pattern has been somewhat explained by the fact that jewelry production is gearing up for the holiday shopping season. I personally don't buy into this story, but I also can't argue the obvious pattern. I am typically not fond of trading the metals markets with futures due to the high levels of volatility, but buying a mini futures contract at these levels seems attractive. If you have the capital, and the guts, to trade the full sized contract you may want to use options as a hedge. It is often said that the currency markets can develop the best trends, and they may have proven themselves in recent weeks. The U.S. dollar has consistently forged gains vs. the major currencies. Because currency futures are, for the most part, paired against the dollar it is a good idea to use the Dollar Index as a gauge on the greenback. This is the case regardless of the currency that you may be trading. For example, if you believe that the Yen will fall out of favor against the dollar you may want to look at the index to see how the Dollar is doing in general. If you are unfamiliar with the Dollar index, it is comprised of a basket of major currencies, with the Euro making up the majority (approximately 60%). 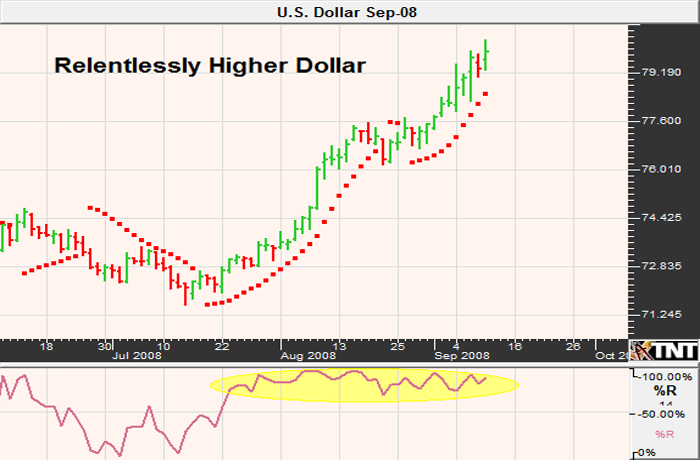 It has been difficult to avoid the headlines regarding the recent dollar recovery. After trading at all time lows, the index has appreciated by well over 10% since mid-July. Although currencies have an interesting ability to trend, there are bound to be corrections and it seems like a moderate pullback may be looming. However, my projections are suggesting that this move has the potential to ultimately bring the index to just under 85. I believe it to be too risky to try to play the upside of this market from current levels, but a pullback may provide opportunities to buy calls, or construct synthetic calls through the purchase of a futures contract and a put option for insurance. 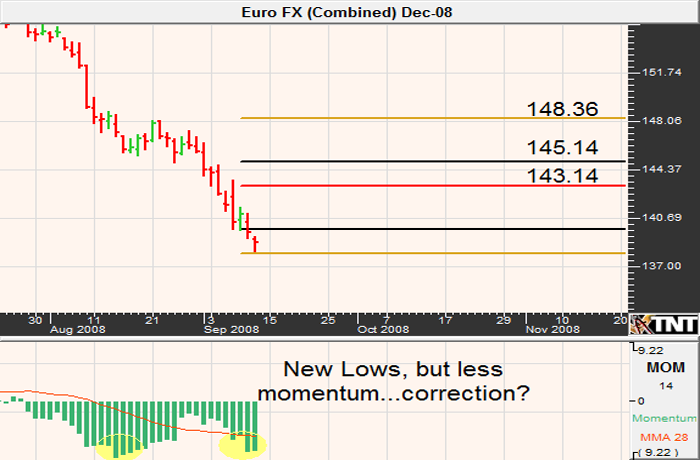 The trend has been decisively lower in the Euro, but things may be ripe for a change. The carry trade and other fundamental factors have taken its toll on the European currency, but technical factors are going to have to come into play at some point. Friday's trade makes an option spread unattractive, unless the market weakens early next week. Keep in touch with us for possible opportunities. The Pound has experienced an almost ludicrous level of depreciation against the U.S. dollar and many other major currencies. On September 2nd, we were recommending to use an option spread in an attempt to catch a possible technical bounce. Remember, markets can overshoot their equilibrium but must eventually find more stable ground. 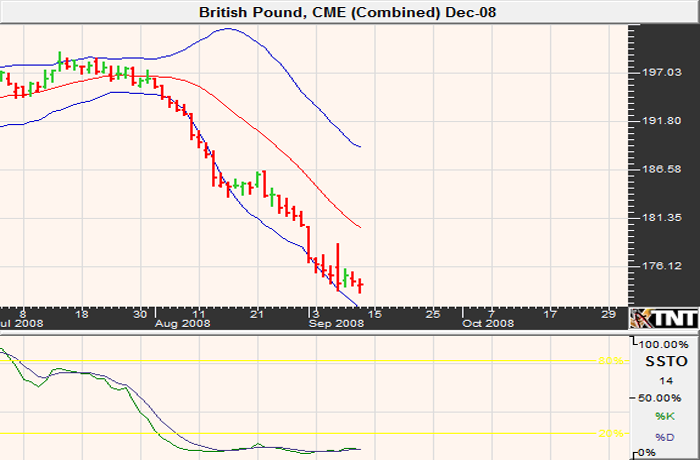 The trade was a bull call spread with a naked leg using the October British Pound options. On the 2nd, it was possible to buy the October 178 call for 195 points, sell the 182 call for 65 points and sell the 174 put for 127. The net cost of the trade was 3 ticks or $18.75. The margin required is estimated to be $1,500 but can and will fluctuate. In times in which the market is moving unfavorably to the trade, the margin may be as high as that of the futures contract. The maximum profit on this spread is $2500 and the risk is theoretically unlimited below 174 (similar to the risk that a long futures trader would face). In this case, the market did go against our expectations temporarily and created an uncomfortable situation for those that happened to be in the trade. However, Friday's move above 178 was extremely beneficial for this position. Please contact us with any questions or comments regarding this strategy. Don't count sugar out! This is one commodity that has probably lagged its actual potential. While grain and energy futures were benefiting from the ethanol buzz, sugar prices failed to make much headway. Granted, prices are double that of a few years ago but the efficiency in producing ethanol from sugar relative to corn should provide a price floor. 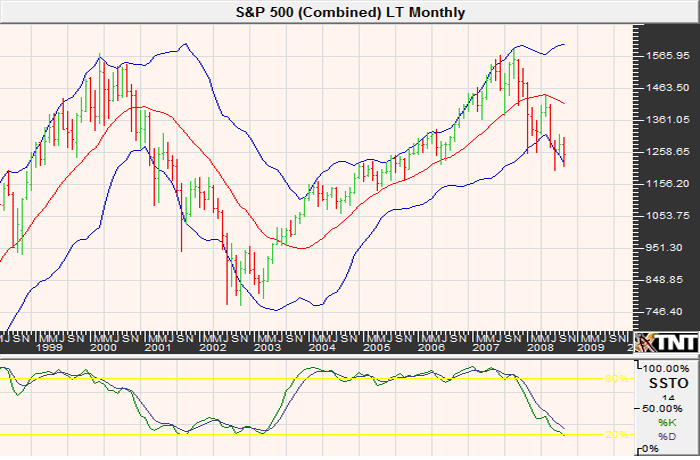 The market has been trading in a range all summer and looks to be at or near supportive technical levels. 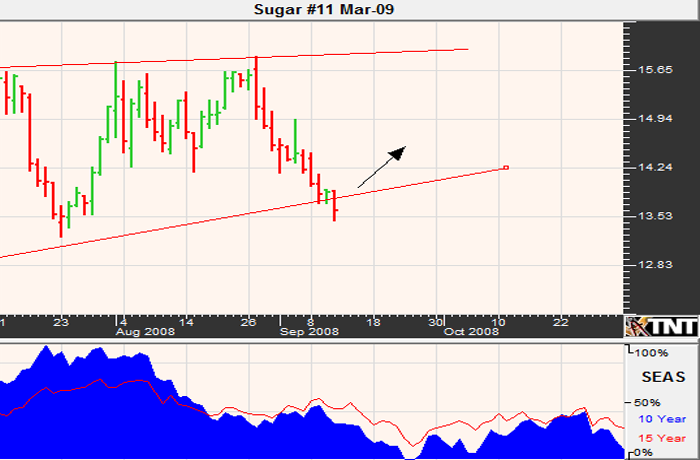 Also helping the prospects for a move higher, Sugar seasonals are pointing higher. This is a great market to buy options in due to their inexpensive nature. I like the March of 2009 18.50 calls for about $320 before commissions and fees. The risk is low, but the profit potential is unlimited and may be a reality should commodities regain their composure. 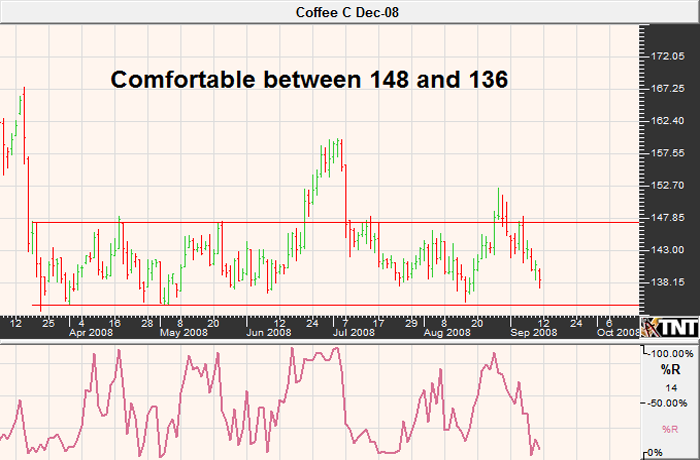 December coffee seems to be on a path moderately lower but should find support near 136.00. This market has been range bound between 148 and 136 for quite some time; if you have followed coffee at all you know that this won't last forever...it never does. When this market finally picks a direction, it will likely be in a swift fashion. However, until then it is logical that traders appreciate the current price envelope and make decisions based on the assumption that support and resistance will hold. Coffee can be a fierce market and should only be traded by those that have adequate tolerance to risk, thus aggressive traders may look to get long this market via option spreads or futures near 136. 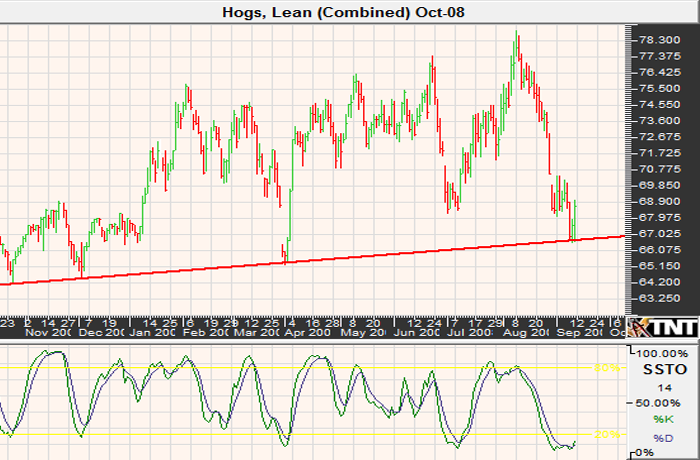 Hogs are beginning to look "cheap" again. The last time that we saw prices this low, the market made a sharp reversal and eventually traded back in the mid-70's range. Since 2003 prices have traded between 50 and 80 cents, so there is always room for the market to move lower. However, in more recent years prices in the low 60's have triggered rallies and many of these rallies have been extremely sudden and sharp. This market can be too unforgiving to sell puts in, and the liquidity issue magnifies the risk. Therefore, although I am normally not an advocate of option buying, especially in the meat markets due to a lack of liquidity, there may be opportunity here. Be sure to contact us for ideas but the October 72 calls for about $350 plus commissions and fees seem like an interesting play. This should be considered a bit of a lottery ticket strategy, but offers low risk and if the market moves like it has in previous 2008 dips it could pay off. Word on the street is that the recent selling pressure in cattle was simply "panic liquidation". 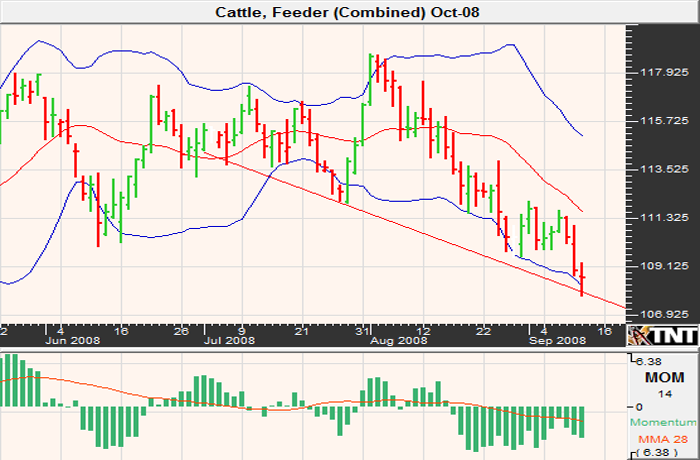 According to sources, many analysts are looking for live cattle to find a low in the coming week. 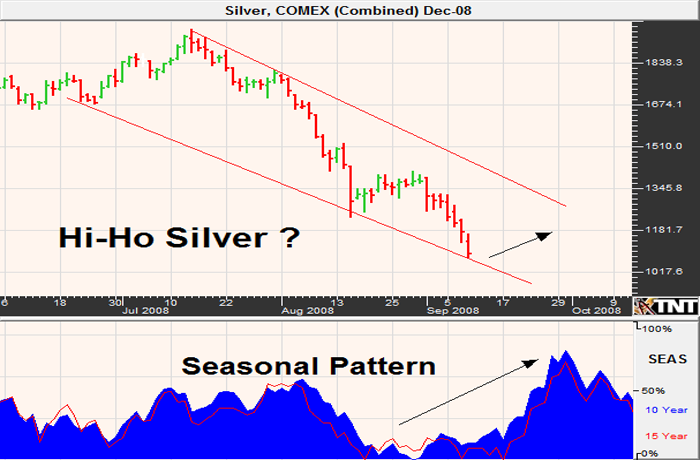 Some are going as far as to call for a sharp rally as we head into the holiday season. While I am far from an expert when it comes to the meat complex, I can tell you that technical analysis and seasonal tendencies favor an up move and I certainly wouldn't trade against the theory of higher prices. Perhaps the fundamentalists have it right this time around.